In the Parliamentary budget session of 2005-06, the proclamation of a vision was made. It was not a novel idea as a whole but nevertheless, was huge in the sheer magnanimity of its stature. Experts went on to call it one of the biggest reforms since independence. Many of those experts were brought together to formulate a concrete strategy and law for the plan’s implementation. Many deadlines were flouted. The deadline of roll out in the year of 2010 could not be met. The bill for constitutional amendment (Constitutional Amendment Bill 115) was finally tabled in the 2011. It went under several sessions of deliberation and finally expired with the dissolution of the lower house. After the new Prime Minister came at the helm, the promise was to roll out the bill by April 2015. The Constitutional Amendment Bill 122 is lying, right now, with the select committee formed to review the same. The targeted date of roll out of the plan has been pushed to April 2016. The real date of roll out still remains uncertain. The master ‘plan’ being talked about here is that of roll out of Goods and Services Tax (GST) – arguably the biggest tax reform in the history of independent India. 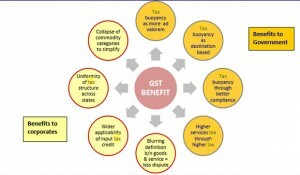 Center: Central Excise duty, Duties of Excise (Medicinal and Toilet Preparations), Additional Duties of Excise (Goods of Special Importance), Additional Duties of Excise (Textiles and Textile Products), Additional Duties of Customs (commonly known as CVD), Special Additional Duty of Customs (SAD), Service Tax, Cesses and surcharges insofar as far as they relate to supply of goods or services. State: State VAT, Central Sales Tax, Purchase Tax, Luxury Tax, Entry Tax (All forms), Entertainment Tax (not levied by the local bodies), Taxes on advertisements, Taxes on lotteries, betting and gambling, State cesses and surcharges insofar as far as they relate to supply of goods or services. 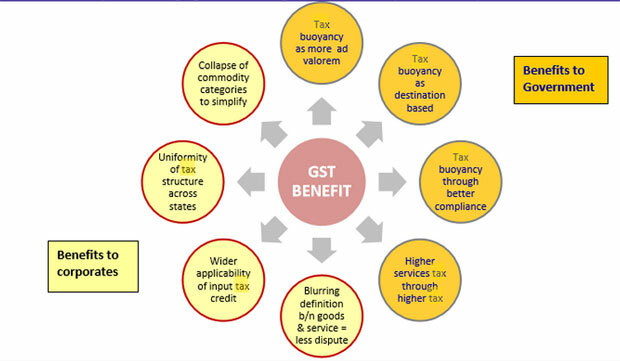 The major point of difference between GST and the current tax structure is that GST would be applicable on supply of goods or services as against the present concept of tax on the manufacture of goods or on sale of goods or on provision of services. GST would be a destination based tax as against the present concept of origin based tax. Hence, exports would be zero-rated. Also, due to common base, it will do away with the cascading effect as well. Also, it will ensure that the cost of tax collection is not more than the tax collected itself. Harmonization of center and State tax administrations, which would reduce duplication and compliance costs. The impact is widespread and can be seen across markets. GST is expected to result in major rationalization and simplification of the consumption tax structure at both Centre and State levels. Depending on the final GST base and rate, there will be a significant redistribution of tax across different goods and services. Goods currently subject to both Centre and State taxes should experience a net reduction in tax, with positive impact on consumer demand. Besides simplifying the current system and lowering the costs of doing business, GST will call for a fundamental redesign of supply chains. GST is also expected to result in a reduction in inventory costs. Dealers would be able to claim a credit for the tax paid on their inventories, leading to improved cash flows. The biggest speculated advantage is in terms of a reduction in the overall tax burden on goods, which is currently estimated at 25%-30%. Exports are bound to gain impetus by implementation of GST which will be in-line with the ‘Make in India’ campaign of the incumbent Modi government. The ex-finance minister of India said in an article dated June 14 2015 in Indian Express ‘We are on the cusp of the most important structural transformation of the indirect tax system. Let us not flunk the test.’ Indian government has come a long way in making India a country which can provide a conducive environment for organization-consumer interaction. 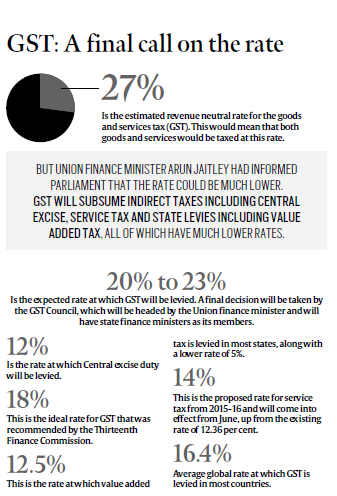 Although the rate of GST has not been defined till now, the current finance minister in his interactions with the media has advocated for a rate much lower than the revenue neutral rate of approximately 27%. The major policy push is towards increasing the tax base. This will go a long way in keeping India in the early stages of Laffer’s curve which may spur development in coming decades. The intricacies of the law and subsequent IT infrastructure need to be made elaborate for a smooth roll out of the reform. Training the officials and educating the common masses need to be high up in the agenda of the government as well. Although the roll out has been delayed for a long time, a smooth roll out with limited possibility of dispute is critical. In any case, it is ‘Never too late’ for something good to happen.